Lake City-based Hunger Intervention Program works to bring food to local families through its Healthy HIP Packs Program, free summer meals for kids, and by advocating for hungry families. This month HIP is officially launching our new blog, HIP Stockpot, as a resource for easy, low-cost, and delicious recipes as well as news, events and ways to get involved in addressing hunger in our community. Each month we’ll feature new recipes on HIP Stockpot and with our friends at Lake City Live. 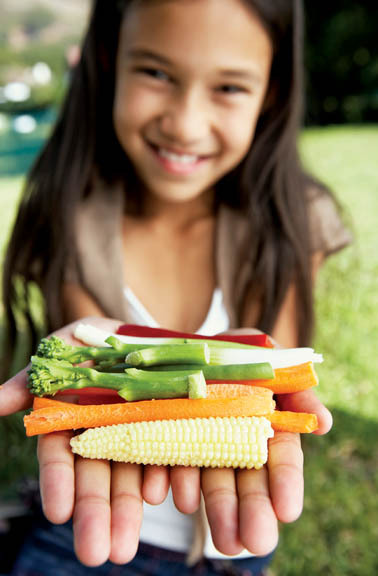 As many parents know, kids can be, let’s say particular about what foods they eat. The ultimate food connoisseurs. Last summer during our inaugural summer meal program, HIP discovered several favorite lunches and snacks for kids that they can even help make. Getting kids involved in the kitchen has been shown to help increase a child’s “adventurous tooth” and help them be more willing to try new foods. All of these dishes will be featured out at HIP’s summer meal sites this summer. While school is out, Hunger Intervention Program offers free summer lunches for all kids and teens at its four meal sites in north Seattle. For a complete list of our sites and what foods we are serving, click here. Come join us for lunch and check out our fun activities as well. Check out the HIP Stockpot for more easy recipes to try. These popsicles can be recreated with your favorite fruits. Peaches and raspberries, watermelon and lime, cantaloupe and honeydew, the possible combinations are endless. 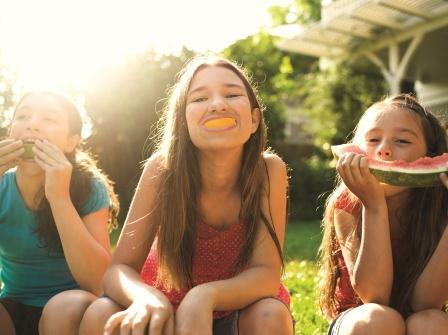 Kids can help to chop and mash up fruits, set up cups, and insert popsicle sticks. There are lots of options for popsicle containers out there including reusable plastic containers, these locally-made cool “otter pop” like sleeves, or, our choice, the old fashioned small paper cup with a popsicle stick stuck into it. Whichever delivery method you choose, these cold treats will be a healthy hit on hot summer days. Roughly chop up pears. Set aside. Cut plums up and combine in a medium pan over low heat. Cook until the fruit begins to break down and soften, about 5-10 minutes. Cool. Blend or mash together the pears and plums. Line a pan or baking sheet with small cups. 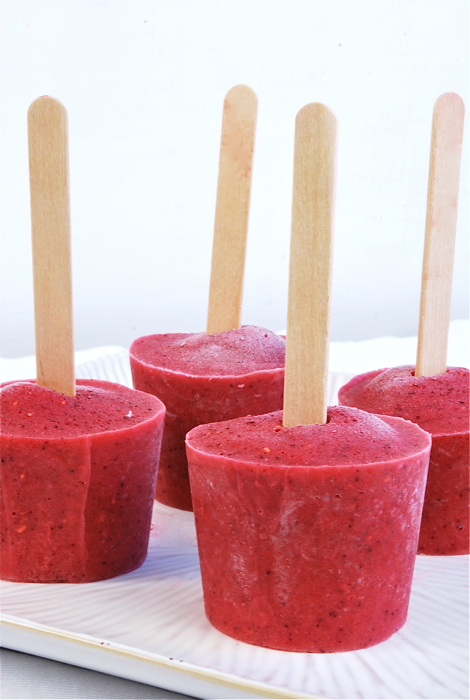 Pour the plum puree into small cups and insert a popsicle stick in middle. Freeze until firm, about 4 hours. This salad is one of those ways to easily pack more vegetables into your meal. As a bonus, it has eye appeal too. You can also make this salad with tuna or chicken. Kids can help measure, mix and practice some chopping here. Combine salmon, vegetables, onion, parsley, red wine vinegar, mustard and oil in a medium bowl. Season with salt and pepper. Serve with crackers, on lettuce as a salad or on bread as a sandwich. An old childhood recipe of ours, these turkey meatballs stay so moist that they are really tasty on their own. But, they are also delicious over pasta and tomato sauce or in a meatball sandwich. Younger kids can help measure out the bread crumbs, pesto and ketchup while older kids can help to roll out meatballs. Remember to wash your hands before and after handling raw meat. If you prefer your meatballs crispier on the outside, you can also brown them in a pan on the stove before baking in the oven. Preheat oven to 350F. Line a baking sheet with parchment paper or drizzle with 1-2 teaspoons canola oil. Mix together ground turkey, bread crumbs, pesto and ketchup. *We recommend cooking a test meatball on the stove and adjust ingredients to taste. 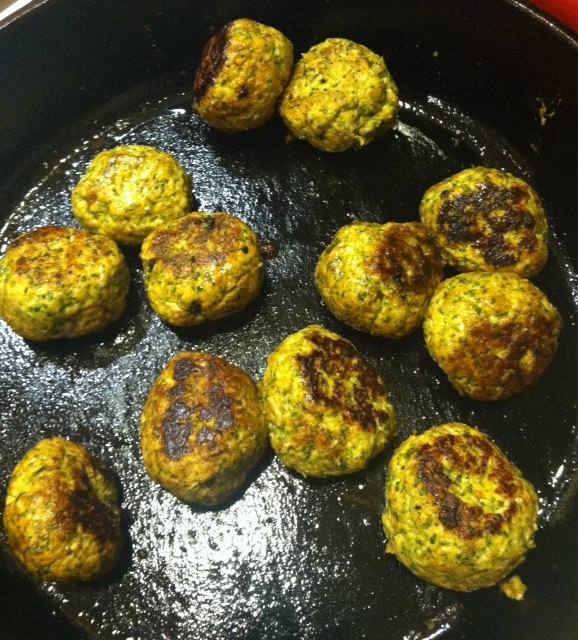 Roll out 1-inch meatballs and place on prepared baking sheet. Bake 20-25 minutes or until the meatballs’ internal temperature measures 165F (or until no pink remains).